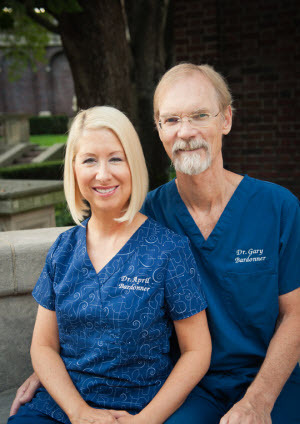 Dr. April Bardonner & Dr. Gary Bardonner - World Class Smiles! When you visit Columbus, IN dentist Dr. April Bardonner & Dr. Gary Bardonner your smile is our top priority. Our entire team is dedicated to providing you with the personalized, quality dental care that you deserve. Bardonner Family Dentistry conveniently has office locations in beautiful Columbus & Greenfield, Indiana. We are devoted to restoring and enhancing the natural beauty of your smile using conservative, state of the art procedures that will result in beautiful, long lasting smiles! We believe in treating each and every patient as if they are part of our family. We strive to make each patient's visit to our Columbus dental practice as relaxed and comfortable as possible. Our friendly staff is always willing to assist and answer any questions or concerns. We make sure that you and your loved ones are taken cared of from the moment you walk through our doors. If you bring your children, they can enjoy the children's section while you wait for your appointment with our dentist. While waiting, adults can utilize free Wi-Fi as well as enjoy a cup of coffee, tea or water provided by our dental office. At Bardonner Family Dentistry, we want to make each and every patient as comfortable as possible. Columbus - Call (812) 376-6714 or Request Appointment! If you are looking for family dentistry or cosmetic dentistry, Columbus Dentists, April & Gary Bardonner offer comprehensive dental procedures. Please come and visit our Columbus, Indiana dentists.